Philadelphia choreographer-dancer Roger Lee has been hoping to start a dance collective to celebrate Black History Month since he was a high school student studying dance. A graduate of Drexel University, Lee is now fulfilling that long held dream with his first annual dance concert commemorating Black History Month. Roger Lee Dance will perform their first annual Black History Dance Celebration series at The Performance Garage in Philadelphia this month, featuring danceworks by seven choreographers. 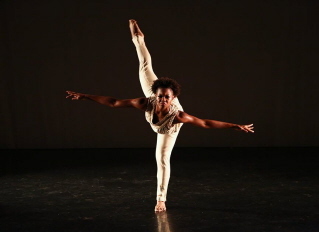 Last spring Lee's troupe performed a contemporary ballet with black history themes. "I did a piece about segregation, integration and civil rights and many audience members told me it really touched them and asking when we would be doing another dealing with the same ideas," he explained earlier this month, while rehearsing his company. After that performance Lee decided, going into the third year with his company, the time was right to stage the concerts, because the performing arts community wasn't doing much to observe Black History Month. Lee said he had some choreographers in mind, but opened the submission process to everyone, "I was hoping to get four or five inquiries but I had 14 submissions for the first year, " he said. It was very difficult to choose and basically, I made choices based on representing different aspects of black history, past, present and future. Some pieces were new school dance, a lot of urban culture to it, representing where we are going. Other pieces are more historically themed- dealing just with the Underground Railroad, for instance, one has narration by Maya Angelou, another Martin Luther King. I love examining the history and finding ways to keep it relevant. Presenting work for the Black History concerts are Diane Matthews, Sonia James Pennington, Michael Nguyen, Areal Bell, Kamali Hill and Ronnique Murray -- choreographers from the Philadelphia region and Washington, DC. Some of the dance pieces also have live musical accompaniment by vocalists Tatiana Barbosa and Pete Serratore. Even assuring the series would have as much diversity in content as possible Lee said "being a show about black history, people draw a conclusion, they might expect a lot of Lester Horton movement, for instance." Like other African American choreographers, Lee grapples with preconceived notions about the African American dance companies. "Is black dance about the choreographer, or is it a genre or is it black people dancing or is it the certain music. I don't know if I have the answer to those things," Lee observes. "What if it's a multiracial company dancing... is it still black dance, so these are the things I ask myself. And I don't really have the answer for all of it." he said. "But, I have to be true as a choreographer. For me I can do a Horton piece and do a 'praise piece' but for another choreographer, they may choose all ballet movement and that's their version of black dance, so it is very individual." Lee feels simply "if you are black and dancing, it's black dance." Lee seeks to connect with his audience every time his company performs. I think about the audience in every show. And it keeps me going. I think this time of year maybe they would want something more uplifting. For the concert, Lee's own dance piece (yet to be titled) is a 35- minute mixed style contemporary dance scored to pop, soul and gospel music. In addition to running his own company, Lee has a wide range of other projects including being a journalist, visual artist and a much in-demand dance instructor. He recently was invited to teach master classes at the Broadway Dance Center in New York. Lee never thought he would have the chance to teach there, but then he got the call. "I ran two master classes in Afro-jazz, which seems to be my forte. It is a style with the same attack as African dance, with the jazz dance line and pulse, I feel like I've always been about that kind of movement," he said. In Philly, he teaches dance students headed for a career, classes with kids as well as conducting classes with senior citizens which, Lee says, he not only loves and learns from. For complete information about the company go here.